As a family dental clinic, we understand that visiting the dentist for the first time can be a big step for kids. In fact, going to the dentist can be a dreaded experience for children, what with all the metal tools, drilling noises, and masked dentists poking around in people’s mouths. However, visiting our Ottawa dental office for your child’s first general dentistry appointment doesn’t have to be scary — we’re here to make their dental experience comfortable, easy, and even fun! Of course, there are things you can do at home to prepare your child for their first dental appointment so they know what to expect, which is why our team at Trillium Dental is dedicating this blog post to helping you ease their nerves before visiting our Ottawa dental clinic. Continue reading to learn more, and contact us today to schedule your child’s first dental appointment! For kids, watching their favorite characters overcome a fear of the dentist and turn it into an adventure can spark curiosity about the dentist and get them excited for their first dental appointment. If Peppa Pig can do it, so can they! As with most other medical practices, the best thing you can do to prevent your child from feeling anxious about their first dental appointment is to start them early — ideally, before they turn one year old. Once your child reaches toddlerhood, their imagination starts to mature and they are much more likely to develop an irrational fear of the dentist, the pediatrician, and other medical professionals who use scary-looking tools. To avoid this, it’s best to bring your child in for their first dental appointment before their first birthday so they can become familiar with our family dental clinic and our friendly staff of dentists and dental hygienists. Lots of families bring their children in during their dental appointments to give them a firsthand account of what general dentistry is all about. Our dentists and dental hygienists are more than happy to meet your child and explain all our fun gadgets to them as we clean your teeth. This also gives us the chance to answer any questions your child might have about dentistry, like why it’s important to practice good oral hygiene at home, what flavors of toothpaste you can find, and why going to the dentist is fun. They’ll be pleased to know that the electric toothbrushes we use tickle, not hurt! In the event that your child does experience some anxiety when you sit them down in the dentist’s chair, it’s good to have their favorite stuffed animal or blanket on hand to make them feel more at home. Kids find a great deal of comfort in these items, which can help them get through their first dental cleaning appointment if they are nervous or start to cry. Our dentists and dental hygienists are great at comforting kids and making their dental experience fun, but it’s always a good idea to have their stuffed kitty or bunny in your bag if they need it. Our goal is to make each and every child’s first dental experience a fun adventure, and we welcome any comfort items that will help them enjoy the experience. 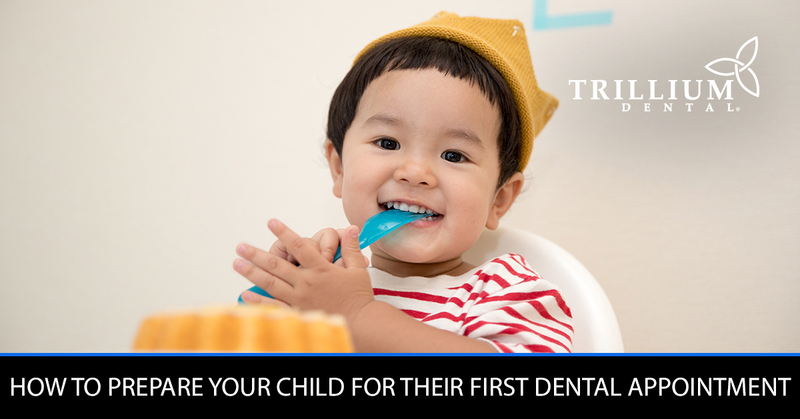 Now that you have some tips and tricks up your sleeve to prepare your child for their first trip to the dentist, it’s time to schedule their first dental appointment at Trillium Dental in Ottawa. We look forward to meeting your child and showing them around our family dental clinic!